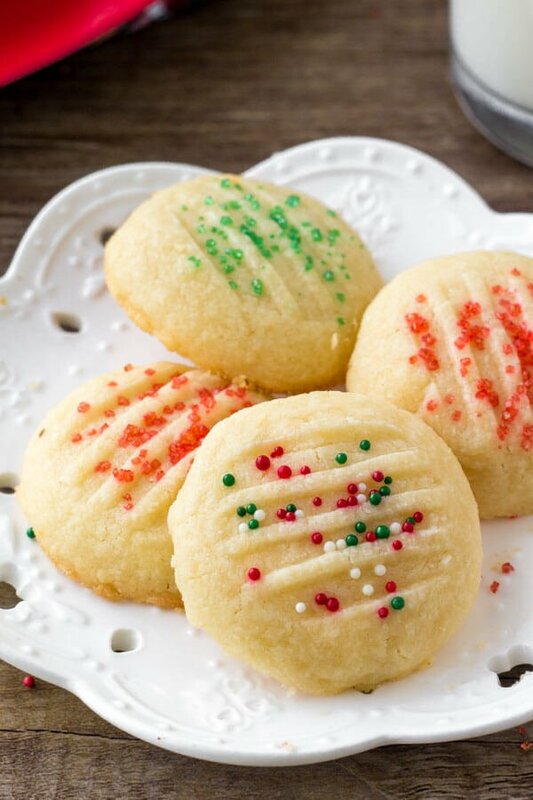 Whipped shortbread cookies are light as air with a delicious buttery flavor. They melt in your mouth because they’re so soft, and only require a few simple ingredients. 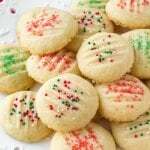 Learn all the tricks for making this classic holiday cookie recipe. Shortbread is such a classic holiday recipe. Buttery, delicious, and not too sweet – it’s the kind of classic that reminds you of your grandmother. What I especially love about whipped shortbread cookies is that they’re extra soft and melt in your mouth. So I figured it was time to share my recipe for whipped shortbread. What’s the difference between whipped shortbread & regular shortbread??? Good question. Regular shortbread & whipped shortbread both use the same basic ingredients. However, when making whipped shortbread you beat the ingredients together for much longer – aka whipping. This adds more air to the batter, which creates a shortbread that’s lighter and more delicate in texture. So unlike regular shortbread cookies that can sometimes be a little dense – whipped shortbread is lighter, fluffier, and has more of that melt-in-your-mouth quality. Use real butter. The main flavor in shortbread is butter – so margarine doesn’t really cut it. The butter should be softened, but not melted. If the butter has melted, the cookies can spread and burn on the edges. Make sure to really whip the ingredients – beat for at least 5 minutes. If you don’t beat for long enough, the cookies won’t be light as air. Making shortbread with cornstarch is necessary for the perfect light, delicate texture. After multiple experiments & recipe tests, I found baking shortbread at 300F gave the best results. If the oven is too high, the edges are likely to over brown/burn and the cookies can get dry. The lower temperature also helps to give that extra soft texture. Lightly dust your hands with cornstarch before forming the cookies into balls. You can use a cookie press if you like, but I find this adds an extra level of complexity, and potential for your cookies to fall apart. After forming the dough into balls, I like to gently press the tops down with the tines of a fork and then sprinkle on a few sprinkles. How long does shortbread bake for???? Longer than most cookies. If you form your cookies into balls about 1 tablespoon in size, they’ll take about 15 minutes to bake. If the cookies spread too thin, that likely means there wasn’t enough flour or the butter started to melt. To fix this, pop the dough balls into the fridge for 15-30 minutes before baking. For best results, only bake 1 cookie sheet at a time on the middle rack of your oven. If you bake 2 at a time with one on a lower rack and the other on a higher rack, the one at the bottom can get burnt on the bottom. 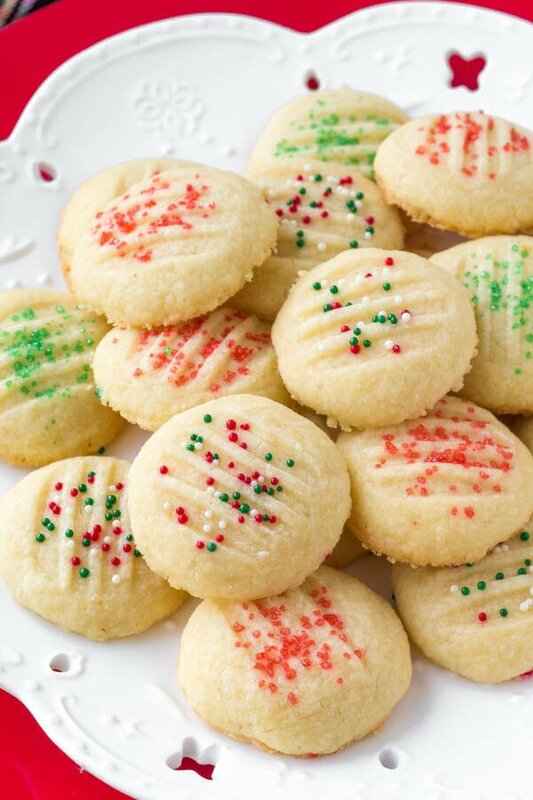 These whipped shortbread cookies make for such a delicious, classic holiday favorite. They turn out light as air with such a delicious buttery, vanilla flavor. 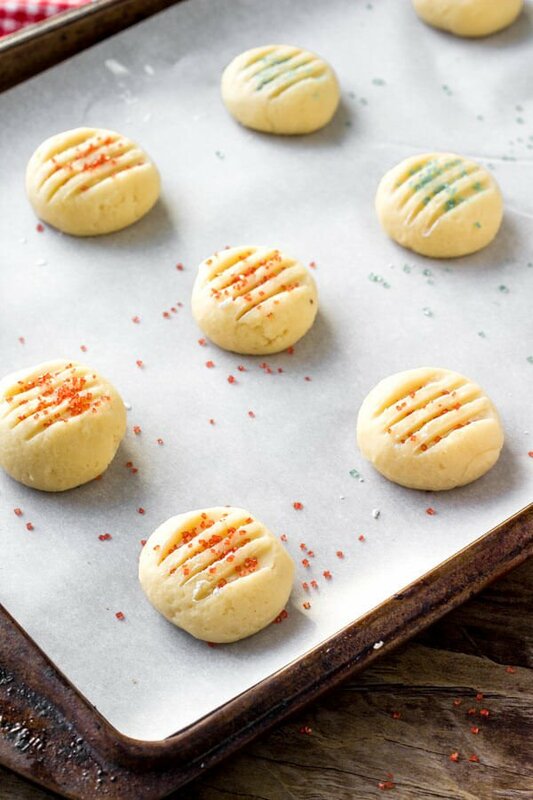 Adding a few sprinkles makes them extra pretty – and they’re the perfect addition to your holiday baking. To freeze the dough, form the cookies into balls first then place on a baking sheet and freeze. Once the dough is firm, transfer to an airtight container and freeze for up to 3 months. Bake from frozen, and add 2-4 minutes onto the baking time. To freeze baked cookies, after baking cool the cookies completely. Freeze in an airtight container. When ready thaw, place the cookies on a cookie sheet or plate lined with paper towel and thaw in the fridge. 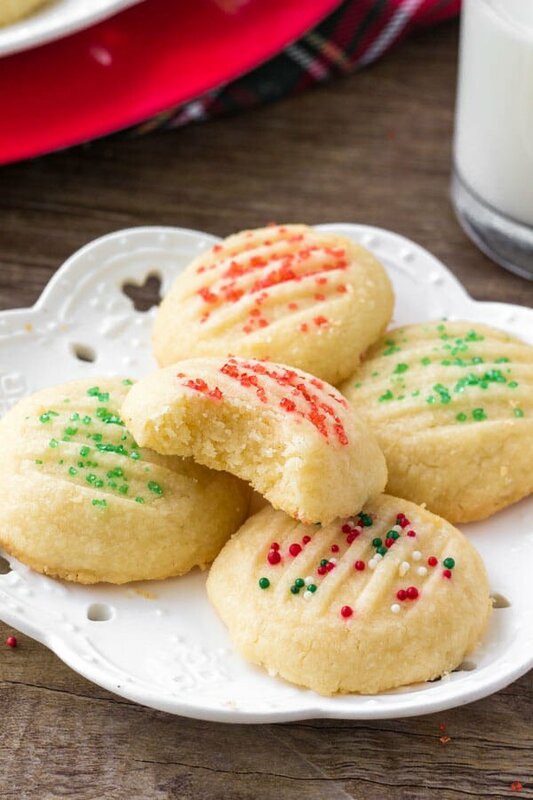 Whipped shortbread cookies are light as air with a delicious buttery flavor. They melt in your mouth because they're so soft, and only require a few simple ingredients. Preheat the oven to 300F degrees and line cookie sheets with parchment paper or baking mats. In a large bowl beat the butter and powdered sugar until very fluffy and aerated (at least 5 minutes. Mix in the flour, cornstarch, salt and vanilla extract. Dust your hands with cornstarch, then form the dough into balls about 2 teaspoons to 1 tablespoon in size. Place on the lined cookie sheets and press down the top of each cookie with the tines of a fork dipped in cornstarch (this prevents sticking). Add a few sprinkles to the top of each cookie. Bake for 14-16 minutes, or until the tops look set. These are incredibly awesome. Perfect ingredients and perfect instructions. Made these twice now. They are easy to make. 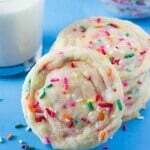 I’m making these for Church tomorrow someone said, they love butter cookies I told them about the ones I made. I didn’t tell them I was bringing them in Sunday. Surprise. I thank it’s very tasty cookies. I’ve made these several times. Always light and fluffy. 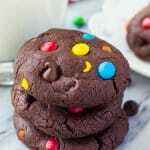 I dip the cookies in chocolate to add an extra flare and sweetness. My husband says these are a winner.